The first quarter moon will set shortly after midnight leaving dark skies for what should be an excellent early morning show. Best viewing will be from a dark location after midnight. 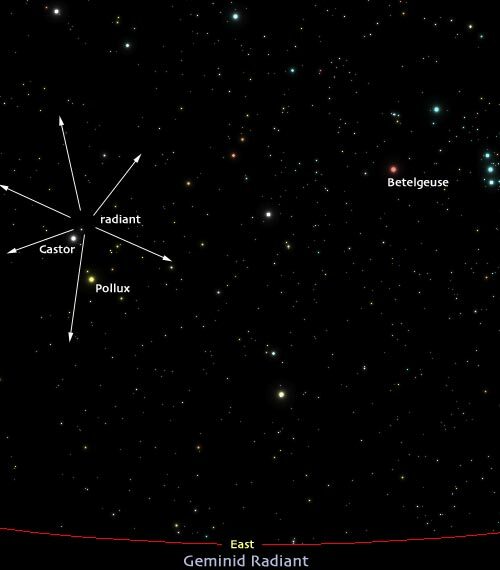 Meteors will radiate from the constellation Gemini, but can appear anywhere in the sky. The Geminids are considered one of the best meteor showers every year because the individual meteors are bright, and the peak can see meteors stream across the sky at rates as high as 120 meteors an hour. Under light-polluted skies, fewer meteors will be visible. The Geminid meteor shower is nearly 200 years old, according to known records — the first recorded observation was in 1833 from a riverboat on the Mississippi River — and is still going strong. In fact, it’s growing stronger. That’s because Jupiter’s gravity has tugged the stream of particles from the shower’s source ― the asteroid 3200 Phaethon ― closer to Earth over the centuries.